It remains a marvelous fact that the most common galaxies—dwarf galaxies, with masses at least 10 to 100 times smaller than the Milky Way’s—are yet so mysterious. We’ve attempted to recreate them in huge cosmological simulations of the universe, but the best dwarfs we’ve created don’t look like the ones we can see in the night sky. 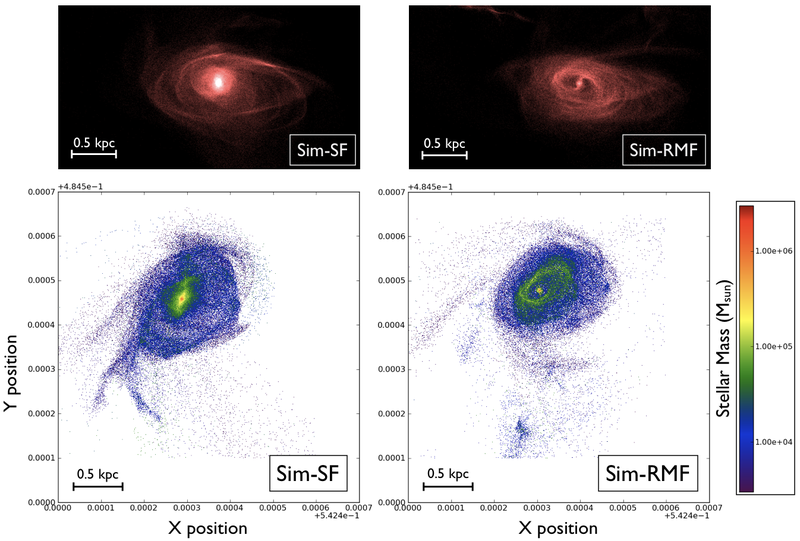 Simulated dwarfs form more stars than the ones we’ve observed. They also tend to have centrally peaked, or”cuspy” density profiles, while real dwarfs appear to have “cores” of constant density. One promising method to reproduce real dwarfs? Explosive stars. When a massive star dies by going supernova, it injects a serious amount of energy into its surroundings. Much of it heats up the surrounding gas, which can expand, destroying surrounding dense, cold clumps of gas—the birthplaces of stars—and thus cause fewer stars to form. The expanding hot gas can also encourage the dark matter that makes up most of a dwarf galaxy to puff up and out—forming cored density profiles. But although this complex chain of events, which astronomers call thermal feedback, sounds quite promising, it can be somewhat tricky to get going. And a supernova’s energy doesn’t all go into thermal feedback. A significant portion—as much as a quarter or so—goes into creating energetic particles such as protons and atomic nuclei that move nearly at the speed of light, also known as cosmic rays. How might these cosmic rays affect the littlest galaxies? A few simple assumptions can take us a long way: we can treat, for one, the cosmic rays as an ideal gas that can move and contract like a fluid that makes its presence felt on the rest of the hydrogen and helium gas in a dwarf galaxy by the pressure it exerts. We can also let this ultrarelativistic gas of cosmic rays travel or “diffuse” through the less energetic hydrogen and helium gas. Pair this simple cosmic ray model with a model of a dwarf galaxy, and you’re set to go. And that’s what the authors of today’s paper did. They carefully crafted a handful of dwarf galaxies—cosmological, high-resolution, real-life renditions replete with dark matter as well as gas that has the ability to heat and cool; star-forming machines converting cold, dense gas into stars; dynamic systems in which the stars and dark matter tread gravitationally dictated orbits and the swirling gas expands and contracts. In order to determine how the cosmic rays affected these galaxies, the authors simulated a dwarf galaxy without cosmic rays, then re-simulated it with. It’s not entirely certain how readily the cosmic rays diffuse through gas, and so they ran the galaxy multiple times, cranking up the cosmic rays’ diffusion power each time. The effects of cosmic rays on dwarf galaxy structure. Shown is the same dwarf galaxy simulated with different cosmic ray physics. The leftmost column is a galaxy evolved with no cosmic rays. The remaining columns are of galaxies with cosmic rays, and differ in how well the cosmic rays can move relative to the galaxy’s gas. In the second column, the cosmic rays just follow the gas; moving to the right are galaxies in which the cosmic rays were allowed to diffuse through gas more and more easily. Diffusion causes gas (top row) and stellar (middle row) disks to form, while no diffusion produces a spherical galaxy. No cosmic rays produces an irregularly-shaped galaxy. The bottom row maps out where the cosmic rays are in each of the galaxies. The result? Cosmic rays can have a striking effect on many aspects of dwarf galaxies. The simulation without them produced an irregularly shaped dwarf that went through spurts of high and low star formation. In contrast, inputting cosmic rays without diffusion—just following the gas—produced a more spherical galaxy, while allowing diffusion produced disks. These results indicate that cosmic rays exert significant pressure on gas and cause it to look more puffy, and when they’re allow to move more independently from the gas, they like to escape from the galaxy, allowing the gas to condense into a disk. The cosmic rays also encouraged the formation of more stars, and at a more continuous rate. 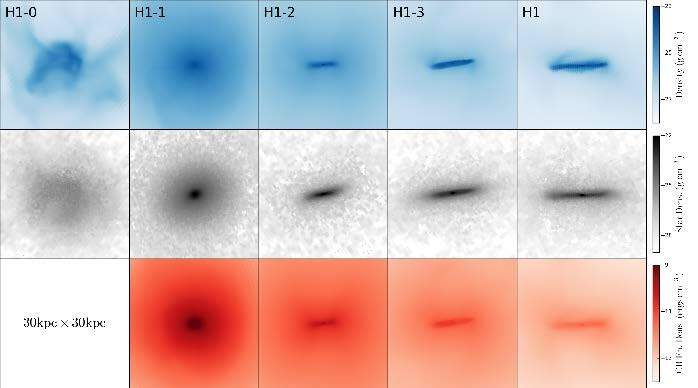 The authors also modeled dwarf galaxies of different masses with diffusing cosmic rays, and found that dwarfs with more mass generally tended to have larger disks and flatter rotation curves. These cosmic ray-laced galaxies seem to contain the correct mass of gas and stars—a theoretical triumph—but appear too good at converting gas into stars. The authors also uncovered one additional curiosity regarding the dark matter. Although thermal feedback allows cored dark matter halos to form, cosmic rays consistently destroyed them, allowing the centers to resume their cuspiness. This is poses another theoretical challenge—observed dwarfs typically have cores. Thus while diffusing cosmic rays can reproduce some characteristics of dwarf galaxies, they can’t perfectly match all of them. A more detailed cosmic ray model that, for instance, adds other important physics such as magnetic fields—which tugs at the charged particles within cosmic rays—may help these simulated dwarfs to appear more like their observed counterparts. Further work awaits for these mysterious dwarfs!